Old Plymouth Restored to it’s Rightful Owner – Southern Tablelands Heritage Automotive Restorers Club Inc. Article reproduced from Canberra Times, Tues. May 9th, story by John Martin. 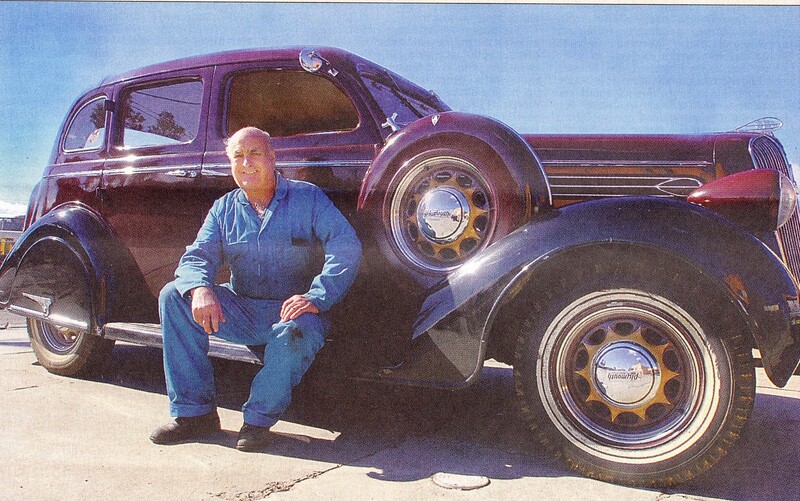 In 1972 Queanbeyan Mechanic, Albert Neuss, now 65, went to Sydney and bought a 1936 Plymouth. It was just like the one from his childhood. Before he was born, Albert’s father, Roy bought a Maroon and black Plymouth which had been used as a taxi in Queanbeyan. The family lived on a farm on the Gudgenby River, South of Tharwa, and Roy used to drive the Plymouth each week to fetch the groceries from Queanbeyan. It was about 60km each way on unsealed road and it was a bone-shaking journey. “It nearly shook the car to pieces” says Albert, who should remember- he had his first ride in the car just after he was born, going home from hospital. When he grew up, Albert used the car to get his licence and later bought it from his father. “It then received a change of lifestyle including a few stints at the Mt Ginn speedway on a Sunday afternoon.” Albert upgraded the car and after a couple of years sold it, but he came to regret it. Albert, who is a member of the Canberra Antique and Classic Motor Club, has restored about 20 cars. At one stage he had seven cars at once. Two years ago he sold to the National Museum of Australia, a 1955 blue-grey FJ Holden which is now on display at the museum. He says he only has four cars now, including a 1942 Chrysler Sedan which was one of 25 acquired by the Curtin Government during World War 2.